To understand this we must emphasize that the idea is not to make houses for poor people but that the houses will help to overcome poverty. In the latest edition of the Venice Biennale, the project of social housing Elementary received the Silver Lion at the Biennale. 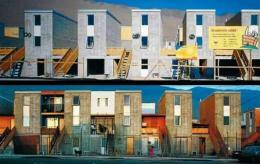 In front is the architect Alejandro Aravena. Soon, the publisher Actar Barcelona publish a compilation of the project. All in all, I decide to chat with Aravena, albeit via email. I answered from somewhere remote from Brazil, where, fortunately, found an internet cafe. His career is diverse and is growing, but we focus on the elementary project. To understand this we must emphasize that the idea is not to make houses for poor people but the houses will help to overcome poverty. "When will housing and no money, the tendency is to make a smaller house. We in Elementary, instead of a small house, we decided to do half a good home. " This strategy has made during the consultation process on access to housing and to build the missing part, users have become aware that they are full citizens. The approach to housing because half of its users do the grow according to their needs was a shift in strategy and an adaptation of each case. "When the funds arrive for half the question is: do quinameitat? Elementary ago that the family could do with guarantees of success. In dry climates, 50% is left undefined space, but in rainy places you need is waterproof as possible and growth occurs inside. It was thought as a whole, not isolated in private: "We did not want to think of housing units of $ 10,000 and repeat them 100 times. We said, what is the best building of a million dollars where we can fit 100 families and their growth? The result is that residential areas and help the socialization. Social networks are key to economically fragile environments. " Elementary tank is a gift as opposed to a think tank. "We spent two years working at Harvard University and Catholic University of Chile wanted to know what to do, but the books and seminars are harmless. Only if you build in the same conditions as the rest of the market project will be applicable, repeatable and enforceable by the people. Thinking is a necessary but not sufficient to change things. " Working under the slogan "more of the same," Aravena and specific: "What matters is to understand the constraints of a problem and suggest either the equation that must be resolved, because terms are not left out. Once formulated the question, respond with more value for the irreducible X of the equation. " To use the term equity for Elementary against equality. "The city is a shortcut towards equity. We intend to improve the quality of life of poorer without waiting to see a redistribution of income. " I wonder if working on projects funded by oil as the oil company of Chile, COPECO, it does raise ethical questions. "If I look at the glass half eight, corporate social responsibility is a washed image. If I look half full, COPEC invested in Elemental in a very daring. Provided working capital to a group of professionals think. Could have put money directly to private and would have ensured the photo, but they invest in human capital. We never demanded that, in turn, mentioned publicly, so I do whenever I can. " To understand the nature of ARAVENA ask for their work process. "I am very ignorant on many topics covered, but I'm strict with my ignorance. When you spend answering questions that require innovation unprecedented abundance of information you can stop and the lack of information do you do fool. Learn just enough forces you to be careful, to move you forward that silly questions combined with many hours of work. "